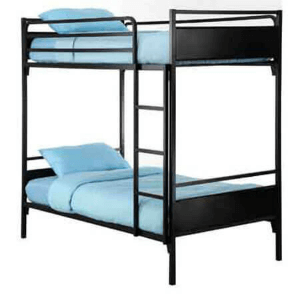 Institutional Grade All Metal Bunk Bed. Separates into two beds. Ladder and Guard Rails can be purchase separately. Lifetime Warranty. Available in two sizes Twin and Cot Size. Weight Capacity per bunk is 600 lbs. Mattress not included in the price. Heavy gauge metal. Simple to assemble. Cot Size Dimension: 34 W x 75 D x 74 H in. Twin Size Dimension: 43 W x 75 D x 74 H in.